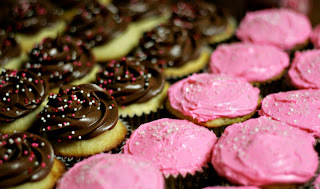 I'm getting kind of tired this weekend, cause I been baking a whole lot of cupcakes. All those folks in Egypt, well they deserving Granny's cupcakes for the way they done behaved. You know, I told those folks when they started out, "Now you act nice and don't act up. You might get mad, but remember what your Granny here might think." And you know these babies done what they was told. So I think they deserve all the cupcakes they can get today, but here's the problem. You see I got the cupcakes goin' but delivering will be hard. There's too much traffic there right now, and too many politicians and other folks shootin' off their mouths, so I might not be heard. So I'll put them on this counter and send them as I can, and any of those folks who get to Cloutierville soon can pick them up right here. We're just past Derry if you're comin' from the north from I49 and just turn off when you see the sign. If you're comin' from the other direction, if you pass Derry, you've gone too far.